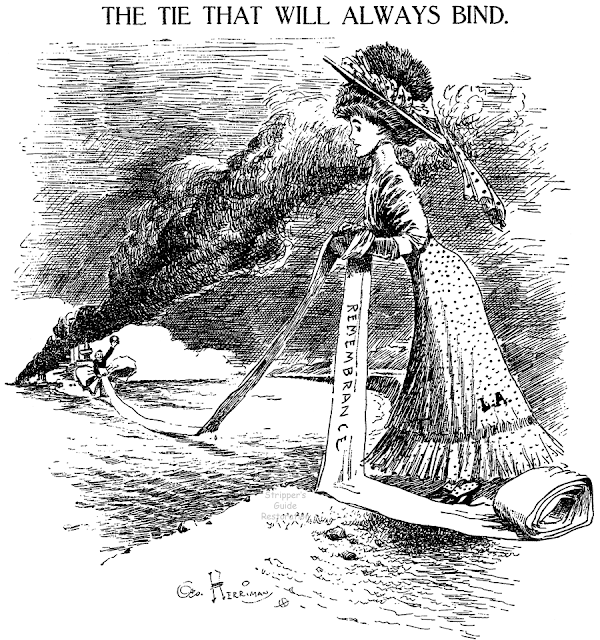 Saturday, April 25 1908 -- The Great White Fleet leaves Southern California, trailing a contrastingly sky-darkening plume of coal smoke. Adam Chase strip #39, originally published February 26 1967. 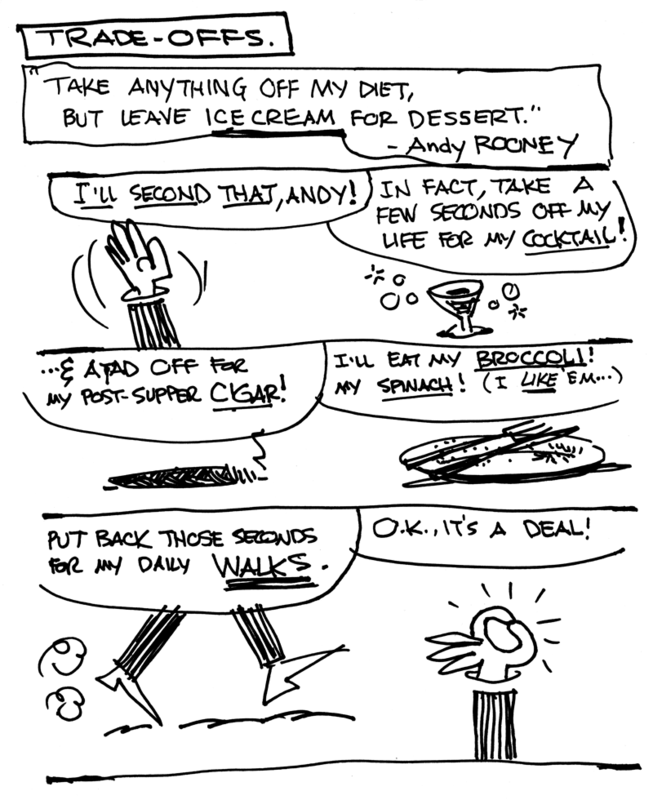 For background on the strip and creator, refer to this post. I'm impressed the story is taking turns I didn't anticipate. It may be unfair to label Bruce Hammond's Duffy as an obscurity. 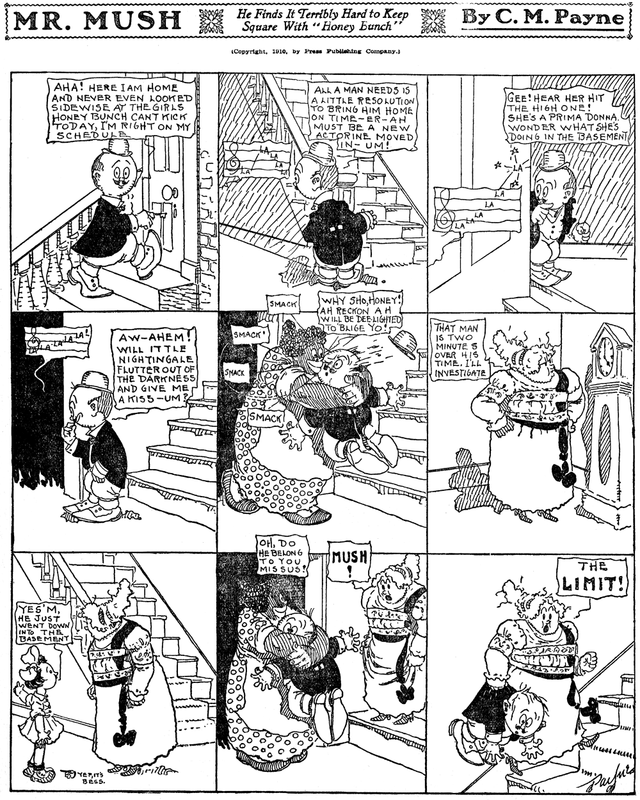 The strip lasted almost a decade and a half, at its most popular was claimed to be running in 90+ newspapers, even got the reprint book treatment once. 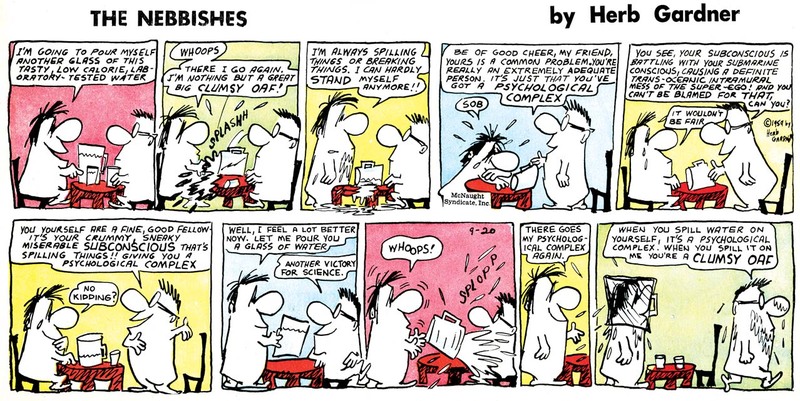 On the other hand, it is a strip that certainly did seem to fly under the radar for much of its existence. 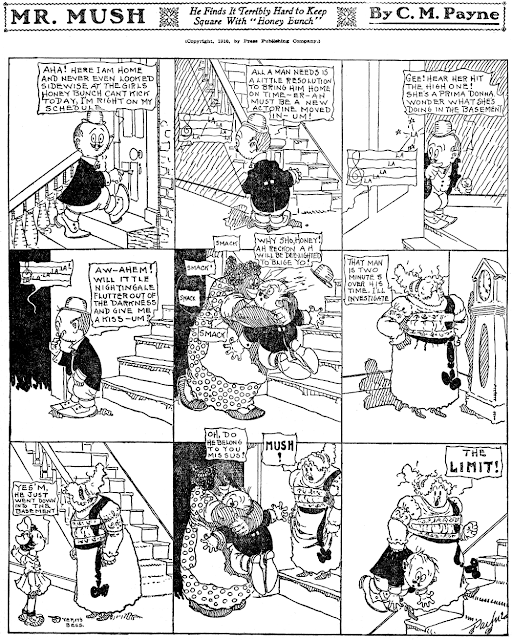 The strip debuted as a Sunday and daily feature on November 16 1981. The setting was a business office, and the main character, Duffy, was a disheveled middle-management paper-pusher type. His comic foils include Jessica James, a ladder-climbing junior exec, Naomi, a nuts-and-berries secretary, Miles Van Smoot, an air-headed executive, and the boss, W.G., who is heard but never seen. 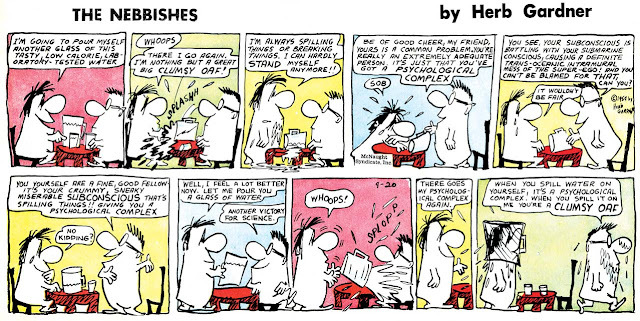 With most of the gags about office politics, technology, and upper management, you could think of this as a precursor to Dilbert, but I think that would be off-base. 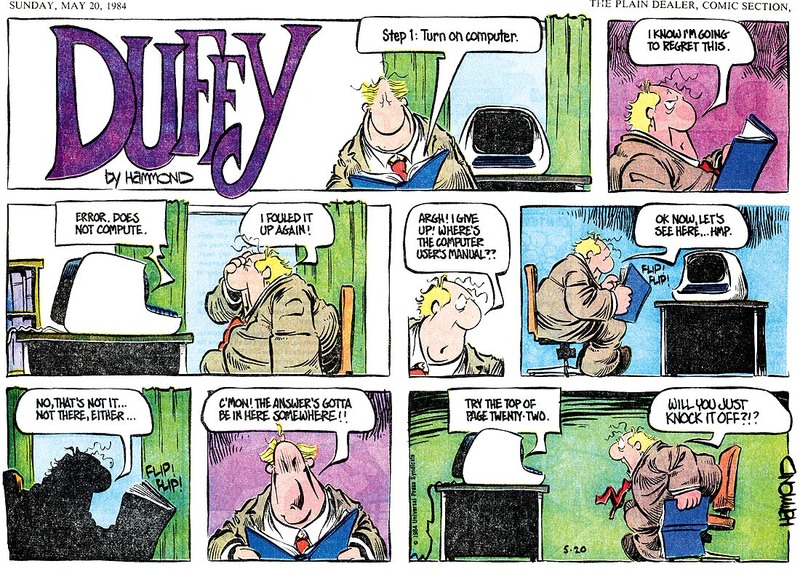 Duffy owed a little more, I think, to the style and gags of Jeff MacNelly's Shoe. Take off the bird wings, and move the Treetops Tattler gang into a generic office setting, and you get close to the feel of Duffy. 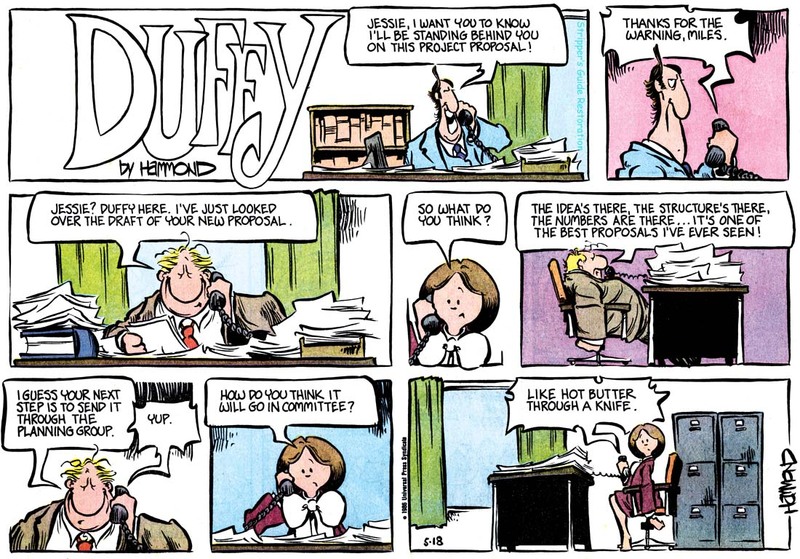 Although Duffy fared well out of the gate, by the late 1980s it seems to have disappeared from most of the 90+ papers that had run it in its best days. As an office-based strip, perhaps On The Fastrack, which debuted in 1984, siphoned off some clients, and certainly in the early 90s Dilbert was killing off the market for all other workplace humor comics. Hammond and Universal Press Syndicate finally pulled the plug on Duffy sometime in 1996, by which time my impression is that its client list was very, very short. 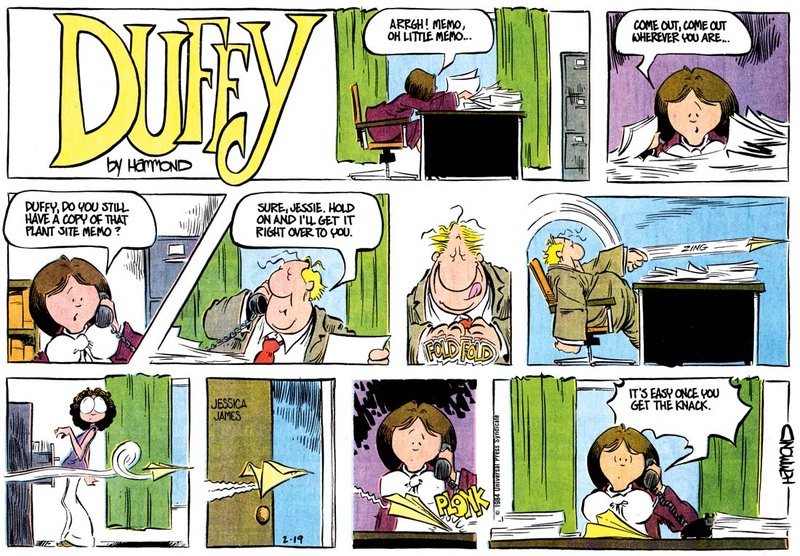 Duffy will be forever known as the comic that replaced Cincinnati's own Judge Parker in the E------r on March 29, 1982. As you have seen in the Cincinnati Post Comic Strip Index Retro, the Post got rid of Rex Morgan MD in 1994. The comic that replaced it? Dilbert. Herb Gardner is best known as a successful playwright, with credits including I'm Not Rappaport and A Thousand Clowns. But before his successful career in the theatre he was already, as they say, kind of a big deal. He'd started acting at age 12, was a prize-winning sculptor at 14, won a TV script contest at 20, and had a novel published at age 23. His initial big success was with a cartoon character. Gardner produced a slobby little character called the Nebbish, and it was picked up for marketing on, as Gardner said, "just about every white surface except surgical masks." Among the most famous of the Nebbish pieces was of a pair of them depicted with their feet up, one saying to the other, "Next week we've got to get organized." 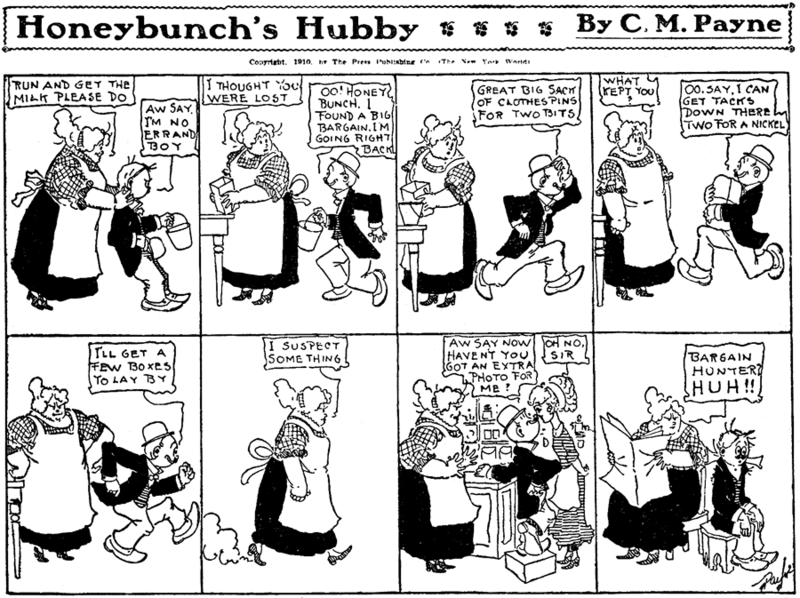 The Nebbishes were a successful novelty brand in the mid- and late-1950s, and Gardner parleyed that popularity into a Sunday-only comic strip series distributed by McNaught Syndicate (not, as is claimed elsewhere, the Chicago Tribune, though the strip did run in that paper). 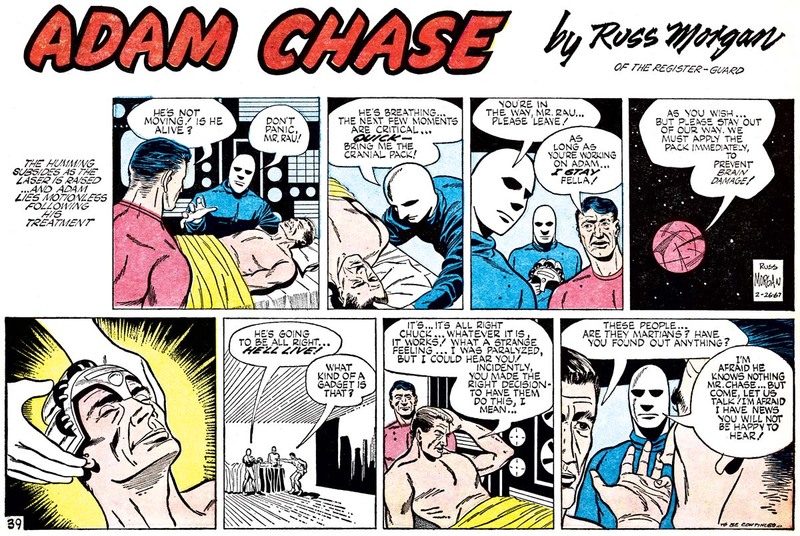 The series began on January 4 1959, and never really caught on all that well. Supposedly the strip ran in as many as sixty newspapers, but that was probably not bringing in the kind of money that Gardner was becoming used to in his other endeavors. He stuck with the series for two years, and retired it on January 29 1961. 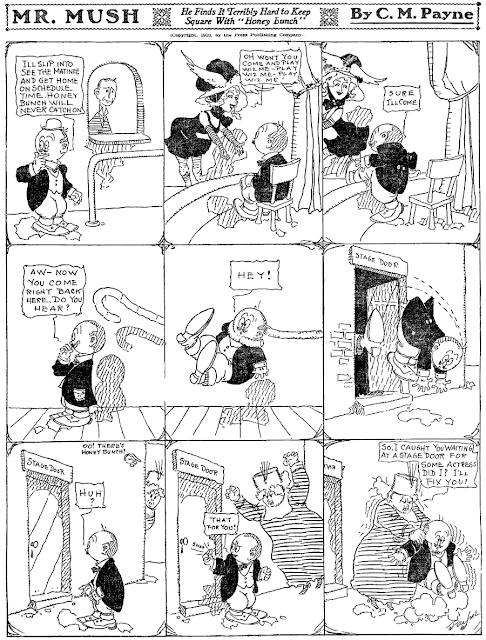 When I was researching this strip, I found that Gardner's only published novel, A Piece of the Action, is actually a thinly veiled chronicle of his own introduction to the world of character merchandising. In the novel the Nebbishes are instead called Slobs, but otherwise everything seems relatively autobiographical. 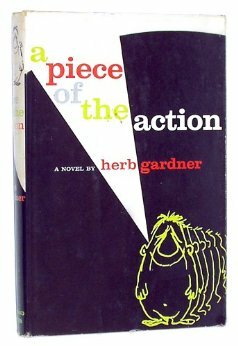 Not only is the novel fascinating for its look into the odd world of gift merchandising, it is a coming of age story for Lou Gracie, Gardner's doppelganger. Gracie is a typically confused young artist, struggling with the competing ideas of art and commerce. Having created the original Slob on a whim, he knows that he has a great character, certainly good for commercial production of some kind. He's aimless though, and nothing comes of it until purely by luck he falls into the orbit of a marketing guru. The sharp businessman manipulates the inexperienced kid into giving up control of his creation in exchange for the prospects of money, power and women. But the kid is no fool -- he knows exactly what is happening. The core of the novel deals with the question of how much control an artist should give up in exchange for security and power. An interesting question, and dealt with in a real page-turner of a novel. I highly recommend it, especially to any of you who are commercial artists. I confidently predict that you'll gobble this one up. If you read the next two posts after that, I reprint all the Nebbishes I saved from the Post. Thanks for this interesting post on Herb Garndner and the book he wrote. Completely agree, Andy. I think Herb Gardner might have had basis for a lawsuit there! Gardner brought the Nebbishes back for a King Features Sunday 1 panel only series. It ran from 14 March 1982 to 13 March 1983. All show the slovenly Nebbish characters with a typically hopeless or pathetic captions like "I haven't had a good idea since 1957" or "Don't blame me if we lose". They almost look like they were comic greeting card art. More Sundays on my blog as well. Mark, I'll link to yors if you'll link to mine. Heck, I'll link to yours anyway. Hi Makr -- Wow, that revival series is news to me. Any chance you could provide a scan or two? Many years ago my wife and I discovered a Nebbish ashtray. It show many Nebbishes running from left to right, with many large arrows pointing in that direction. In the center was one Nebbish walking from right to left, and underneath is his comment: "Nobody tell me what to do". Not too long ago we inadvertently broke the ashtray. I would appreciate it very much if somebody knows how/where we could find either the ashtray, or just a picture of that particular cartoon.